"Lock mode" allows opening more than one position (including opposite ones) for the same financial instrument. The position opened in the Lock mode is not added to the previously opened position on the same instrument. That mode is set by ticking the "Lock" check-box when making a deal or setting an order. By default, the check-box is ticked. "Balance mode" allows opening a position which is added to another position on the same financial instrument, taking into account the direction. The mode is set by unticking the "Lock" check-box. For example, if there is a previously opened Buy position on EURUSD with a volume of 60 000 and a Sell position on EURUSD is opened with volume of 40 000 in "Balance mode", the result will be the creation of one summed Buy position on EURUSD with a volume of 20 000. 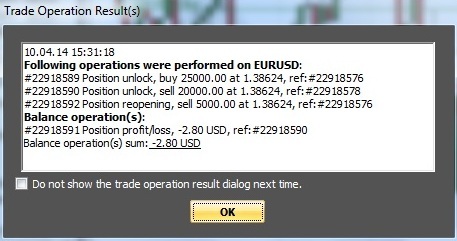 The result of this operation, that is a closing a part of the position with volume of 40 000, is reflected on the account balance, which can be seen in the "Trade Operation Result(s)" window (if the option of showing operation results is set in the terminal settings). Please, note that in case there are several previously opened positions on the financial instrument the summation of positions takes place in the descending order of current Profit/Loss (when executing transactions in "Balance mode").